Aircraft Picture - A Percival Provost T.1 preserved as part of The Shuttleworth Collection. The Percival P.56 Provost was a British ab initio trainer for the Royal Air Force in the 1950s, replacing the Percival Prentice. It was a low-wing, monoplane with a fixed, tailwheel undercarriage. Seating was side-by-side. After a lengthy service career, the design was adapted for a turbojet. 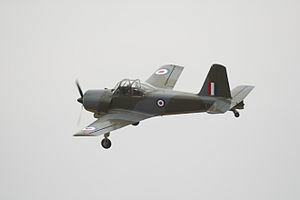 The Provost was designed to Air Ministry specification T.16/48 for a single-engined basic trainer aircraft to meet Operational Requirement 257 for a Percival Prentice replacement. 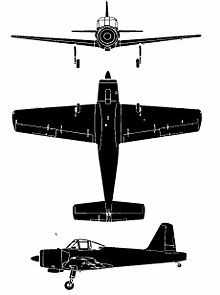 The specification was issued on 11 September 1948 and the ministry received over 30 proposals for consideration two designs were chosen for prototype construction, the Handley Page H.P.R 2 and the Percival P.56. Percival were given a contract to build two Cheetah powered prototyes on the 13 January 1950, the company also built a third prototype with a Alvis Leonides Mk 25. The Armstrong Siddeley Cheetah powered prototype serial number WE522 first flew on 24 February 1950. After evaluation against the H.P.R 2 at Boscombe Down the Leonides powered P.56 was selected for production as the Provost T.1, with an initial order for 200 aircraft being placed on 29 May 1951. Production ended in 1956 when 461 aircraft had been completed. The Percival Provost eventually formed the basis for the Jet Provost trainer which replaced it in RAF service. The Provost entered service with the RAF in 1953. It had more than twice the power of its predecessor, the Prentice, with higher performance and manoeuvrability. The aircraft served with the RAF until the early 1960s, when it was replaced by the Jet Provost. A few Provosts continued in service until the last example was retired in 1969. Several retired airframes were renumbered with maintenance serials and used for training of airframe and engine tradesmen. At least five Percival Provost have survived as civilian aircraft. Provost T.Mk 1 : Two-seat basic trainer for the RAF. Provost Mk 51 : Unarmed export version for the Irish Air Corps. Provost Mk 52 : Armed export version for the Rhodesian Air Force. Provost Mk 53 : Armed export version for Burma, Iraq, Ireland and Sudan. Angelucci, Enzo. World Encyclopedia of Military Aircraft. London: Jane's Publishing, 1981. ISBN 0-7106-0148-4. Clarke, Bob. Jet Provost: The Little Plane With The Big History. Stroud, UK: Amberley Publishing Plc., 2008. ISBN 978-1-84868-097-5. Thetford, Owen. Aircraft of the Royal Aircraft 1918-57, 1st edition. London: Putnam, 1957.